WINNER of the 2013 ' Australian Multicultural Marketing Awards' (AMMA) for the 'Community Award'. 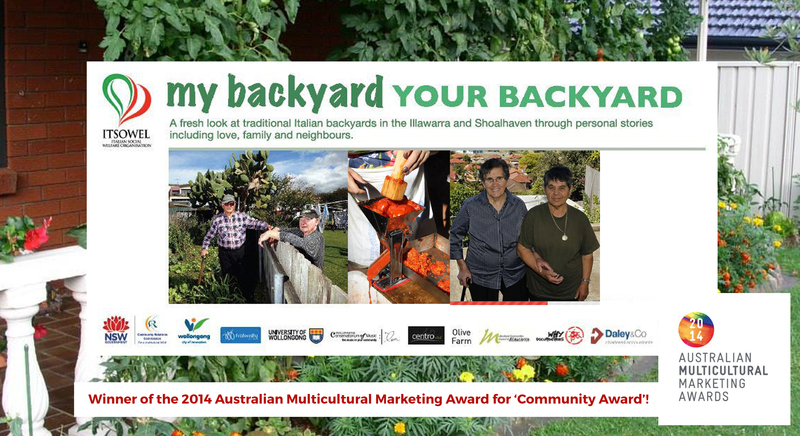 The “My Backyard: Your Backyard” project has been an initiative of the Italian Social Welfare Organisation of Wollongong, produced by Why Documentaries and commissioned by the Community Relations Commission of NSW. We follow four backyards and see how people have linked with them! We see Frank and Fred who have been backyard neighbours sharing vegies and stories for over 40 years. We see a love story, these two are inseparable in their backyard, four sisters who live on the same street and a family of four generations through tomato day! The DVD was successfully launched 20 October 2012 and is available to purchase for $20 from ITSOWEL.